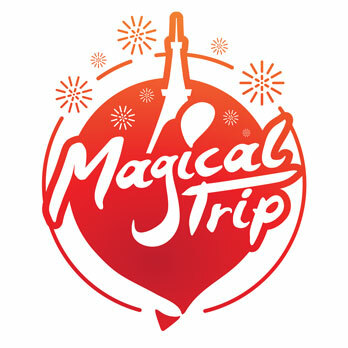 Must-see hot events held in Hiroshima for July, 2017 brought to you by MagicalTrip staff. From events featuring Japan’s tradition such as Cormorant Fishing to events where you can enjoy Fireworka. We highlight the best events for anyone visiting Hiroshima in June, 2017 and wondering what to do. Plan a trip around the various traditional events held in Hiroshima in July, 2017. The Miyoshi Cormorant Fishing is a traditional fishing of the Basen River held from June to early September. “Cormorant fishing”, making an appearance in ancient records and the Manyoshu, holds a long history. The fishing consists of lighting the cool surface of the river with a fishing fire, and the cooperation of the cormorants and fishermen in court noble hats. The cormorant fishermen of Miyoshi use a 6.75m fishing net, which is the longest net in the country, allowing you to watch a dynamic cormorant fishing. You can also watch the cormorant fishermen commanding 8 cormorants up close from an excursion boat. Be sure to watch the fishing unique to Japan. Reservation required & Tickets need to be purchased in advance. Please contact us for advance ticket status. 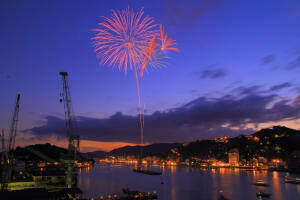 The Onomichi Sumiyoshi Firework Festival is an annual summer festival continuing from the mid Edo Period, and about 1 million and 3 thousand fireworks, including breathtaking starmines, graceful underwater fireworks, rapid fireworks, and music fireworks, which are fireworks synchronized with music, are launched during this festival. This festival is held to pray for business success and waterborne traffic safety to the Miyoshi Shrine, and from its greatness, it is called “the Ryogoku fireworks of the west”, coming from the Great Firework Festival of Tokyo. Prior to the fireworks, in the afternoon, the portable shrine parades around the city’s shopping street, and in the evening, the pleasure boat carrying the portable shrine, along with 3 lantern boats and a fire boat, departs from the Miyoshi Shrine. This traditional “lantern boat crossing” is another attraction of the festival loved by the locals. 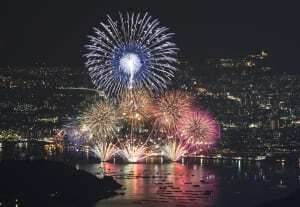 The “Hiroshima Minato Firework Festival”, having the catch copy of “The competitive performance of the master craftsmen in Hiroshima’s night sky~the fireworks museum~”, is staged in the Inland Sea, where the smell of the ocean breeze fills the air, has a concept of “dreams”. After the opening event at the grass field stage in Ujina Hatoba Park, about 1 million gorgeous fireworks are launched. The main point of interest of this fireworks festival is the competition of the top, award-winning pyrotechnicians. You will see fireworks you’ve never seen before, and they are worthy of the festival’s name, “museum”. The contrast of the wonderful fireworks and the Inland Sea is a masterpiece. It is definitely worth seeing. Each year, from mid June to the beginning of July, 350 different and 5000 stubs of Hydrangea bloom at Kannonji Temple each year. 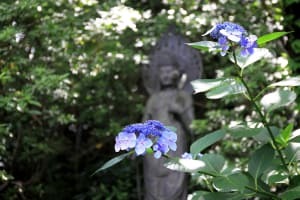 The Kannonji Temple Hydrangea festival is the festival held during that season. During that time, there is a traditional tea ceremony where you can enjoy matcha, as well as the “wind chime festival” where the temple vicinity is decorated with wind chimes, and you can relax and enjoy both color and sound through the cooling sound of the wind chimes, and the vivid colors of the colorful hydrangeas. The festival entertains its visitors with its tasteful summer features. The place is an hour drive from the center of Hiroshima City. The “Yuki Hot Springs Firefly Festival” is held at Yuki Hot Springs, a place full of nature, located in the hot springs district, which is the annex of Hiroshima. Here in this district, 3 different natural fireflies coexist, which is extremely rare. This year, the festival is held for 9 days, in hopes of showing more people the charm of the fireflies of Yuki. The large festivals during the day are held on the two days of June 25th and July 2nd. The festivals at night are held every day from June 24th to July 2nd. 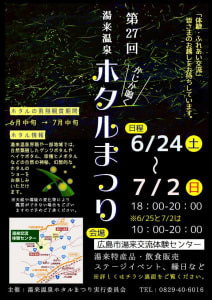 Around the areas of the 3 rivers flowing in Yuki, there are several spots where you can observe the fireflies. Enjoy the sight of the 3 different fireflies whimsically flying about with your family, friends, and significant other.